That is, if you are a member of HSP! Our Strip Pits are so diversified; fishing can be done from shore as well as from a boat. Now there is no debate about which is better. The boat wins hands down. However, on a recent summer day I took this challenge and went to the "Pits" without a boat. I have been a member of HSP for several years. I have duck and goose hunted, as well as fished just about every nook and cranny on that farm. 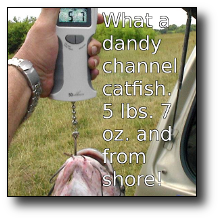 Therefore I believe I know every fishable spot from the land as well as from the water. Some members don't know that there is one definite advantage to fishing from shore. There are numerous ponds that are not accessible by boat. another advantage is that some of the pits are so steep, backing a boat down, or in some cases "roping" a boat down the steep incline is done by very few. Those on foot need only to be in good physical shape and willing to walk the walk! Following cattle trails along the bottom of many pits allow the land fisherman access to water only available otherwise by boat. I liked to carry two fishing poles and a 5 gallon bucket with a lid. 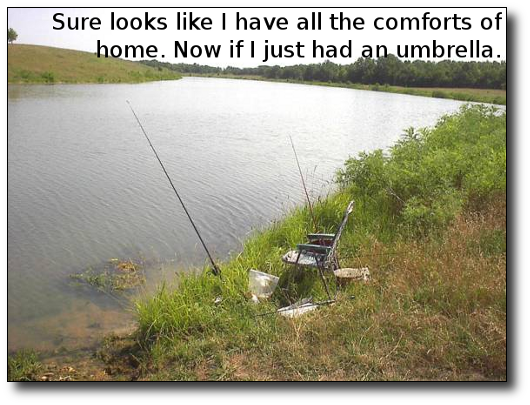 Extra lures, bait for the other pole, and any other miscellaneous gear is easy to carry and a nice seat for resting. Another very important advantage is that there are numerous ponds and a few pits that a fisherman can drive right up to the waters edge. In some cases he might have to walk 50 to 100 yards. The point is, if an individual is handicapped, but could find a "helper" to open the gates and assist him into a wheelchair, out of his vehicle, the best fishing around would be at his disposal. On my trip, I took a lounge chair, three poles, worms, catfish bait, ground rod holders and an ice-chest full of munchies and cold soda pop. The selection process was the hardest part of the trip. I must have changed my mind ten times before settling on two specific ponds. One was accessible only by land. It was 50 yards maximum from the car. 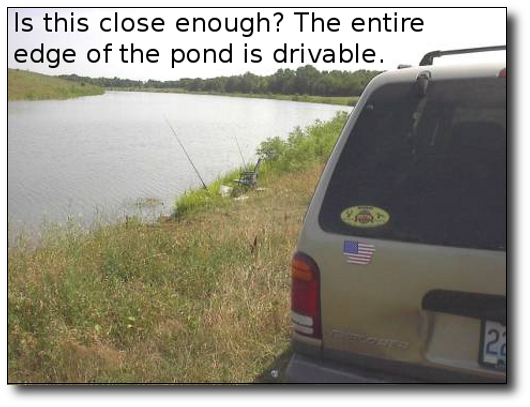 In this case I used only the 5 gallon drum for a seat because I anticipated that I would be walking around the pond using artificial lures for bass. at my original spot, closest to the car, I put out a baited pole with the drag loose for catfish. There was a lot of moss around the lake, forcing me to use top water lures. I caught several bass and bluegill but nothing over a pound and a half. Back at my baited pole within 20 minutes, it was bouncing and line was streaming out. This turned out to be the largest channel catfish I've caught all summer. (see pic). Went to my secondary pit and drove up to the waters edge. Setup one pole with bait and planned to work the edge with artificial soft-baits. By now it was close to 1 P.M. and it was very hot. I used my car for shade when resting, but my plan to work the waters edge went awry. The baited pole had constant hits. 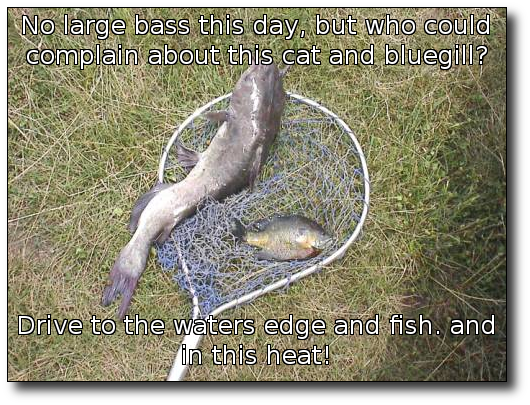 I caught numerous bluegills, one worth keeping, and several small catfish and bass. By 2:30 P.M. I was hot and tired, and didn't have a boat to load. Don't miss the boat...try it and you'll like it. Remember this; just about every body of water on that property has fish in it. Try a couple casts, or toss a worm and bobber in there for a few minutes. You"ll be surprised, and have fun in spite of the heat. Let me know how you do. Take pictures for the Newsletter!